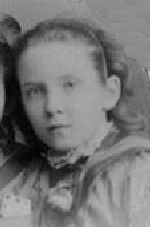 Hilda was eleven years old when her father died in 1888. She spent most of her life at Whitehern with her family. She and her sister, Mary, took care of the large house and the cooking and preserving, etc. They also helped to look after Edna through her numerous breakdowns. Hilda also helped Rev. Calvin set up his manse and was his housekeeper for a time. She was a very capable seamstress and cook, and when the family owned an automobile, she took driving lessons and became the family's official driver, when Tom was not at home. She spent vacations in Ontario and, in 1913 she made a trip to the Continent. Hilda was also active in the Church and Missionary Society with her mother and sister, continued this work after her mother's death. Hilda was very beautiful, charming, and a gracious hostess. 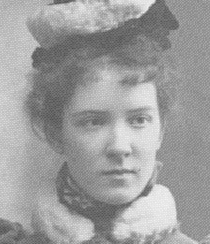 She received a marriage proposal in 1902 from Kenelm Trigge, a son of Captain Trigge, a member of the Plymouth Brethren. Hilda was twenty-five years of age at the time and already a spinster in Victorian terms; however, her mother objected strenuously to this union and there are many letters in which the events are discussed (W4635). The problem was alcohol, and Mary objected to the fact that Ken was a salesman and was forced to "treat" other men to alcoholic beverages as part of his job. Mary "cross-questioned" Ken to find out the truth, and was enraged that Ken would not consider giving up his job. She then convinced Hilda that she was fortunate to have escaped from a man who was unwilling to give up alcohol for her sake (W4651). The incident reflects Mary's fear of alcoholism which, no doubt, stemmed from her experience with her husband, Isaac. Unfortunately for Hilda and Ken, the Hamilton liquor referendum of 1902, was being hotly debated at that time, and Mary's anti-alcohol fervour was at its peak as she attended meetings, wrote letters to the editor, and campaigned for the temperance side. Hilda came to see that rejecting Ken was a moral sacrifice, and she came to agree with her mother against him. The relationship ended in animosity. There are later discussions and rumours about Ken which appear to further discredit him because of an affair with a woman who had a child, but these eventually turned out to be untrue since the woman was a young widow and she and Ken were married. Ironically, shortly before this episode, Mary had expressed regret that her daughters had few opportunities to meet anyone, yet when a suitor appeared, she panicked and actively broke up the relationship. There were no further marriage prospects for Hilda. Her brother Tom often required her assistance as hostess for his political functions, and she accompanied him to many of the social affairs connected with his career in law and politics. She also learned to drive the first family car in 1928. She was ninety years of age when she died at Whitehern, and she is buried in the family plot at Hamilton Cemetery.